When I was a child, we took a lot of short day trips to some of the local historical sites in the NC/VA area. My favorite trip was the one we took to Appomattox,VA. For anyone who is unfamiliar with this historical site, I'll explain a little. On Palm Sunday, 1865, General Lee's surrender to General Grant at Appomattox Court House, Virginia signaled the end of the Southern States attempt to create a separate nation...aka the Civil War! History is fascinating to me and when you realize that visiting many of the historical sites is free or at a very reasonable price, it becomes enticing to me as a destination for a family day/weekend trip. We decided to forgo the normal highway routes and we took the back roads. It was a beautiful trip. The dogwood trees were blooming and the other trees were filling with beautiful green leaves. We were very lucky that the day was sunny and the temperatures were wonderful. They ran in the 70s and we had a nice breeze as well. We didn't realize that we were visiting during the weekend commemorating the 145th anniversary of the surrender. WOW!!! We were shocked and amazed! 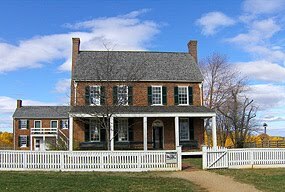 There are many places to visit there, but none better than the Appomattox Court House National Historic Park. There are many wonderful buildings to visit there and lots to see. Prepare to be transformed back in time to 1865! One of my favorite buildings there is the Clover Hill Tavern. It was built in 1819 and it is the oldest structure within the village at Appomattox Court House NHP!!! YES...the original structure! There are many other buildings there, including the courthouse and the McLean house. The courthouse was rebuilt after a fire destroyed it, and the Mc Lean house is a replica filled with period items! The National Parks Service also offers a Junior Ranger Program for kids 7-13. They are given a booklet with tasks to accomplish and when they finish, they are given special treats and a certificate. My husband, 11 year old daughter, and I had a great trip and enjoyed learning about the surrender and life during 1865. Appomattox Court House,VA is a place we plan to revisit! This short, day trip offered me a chance to see things the way they were in 1865 Virginia. Our nation as come a long way. We need to remember and understand our past. If we do, hopefully we'll never make the same mistakes! Thanks for reading about my trip. I was not compensated for writing about it. I just hope someone gets the chance to learn more about history! I love going on trips like that, very cool!